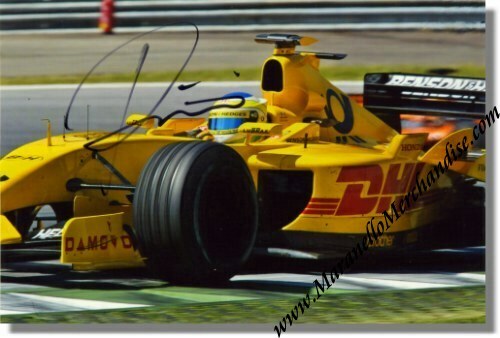 Giancarlo Fisichella signed Jordan GP Photo. A great photo of Giancarlo Fisichella in his Jordan. The photo is personally autographed by Giancarlo with a black sharpie. It measures approximately 15 x 10 cm or 6 x 4 inches. Only 1 available as every autographed item is of course unique. A Certificate of Authenticity will be provided with this item guarantees you that the signature is genuine or we give you your money back.